International multi-Platinum soft-rock icons, Air Supply, return to Australia for three concerts at the State Theatre Sydney on Friday 29 November, Palais Theatre Melbourne on Saturday 7 December (with Very Special Guest John Paul Young & The All Stars) and Perth Concert Hall on Sunday 8 December, as part of their Hits & Memories Tour. Graham is honoured with two BMA Million-Air Certificates which recognise over three million radio plays for Lost in Love (1980’s Song of The Year and fastest selling single worldwide) and All Out of Love, while The One That You Love, Sweet Dreams and Making Love Out of Nothing At All, are well on the way to reaching that achievement. Other singles to dominate the charts are Every Woman In The World, Love and Other Bruises, All That You Want, Making Love Out Of Nothing At All, Two Less Lonely People in The World, Even The Nights Are Better, Without You, The Power of Love (You Are My Lady) and Here I Am (Just When You Thought I Was Over You). Career highlights include pioneering new markets as the first Western act to tour to China, Taiwan and other countries not previously open to our pop culture, performing in Havana to an audience of 175,000 the night before Hurricane Dennis lashed Cuba, participating in Australia’s Bi-Centennial celebrations in the presence of HRH Prince Charles and HRH Princess Diana and an induction into the New York Ride of Fame campaign - where the Gray Line bestows a bus in honour of exemplary community figures. Air Supply is one of our most successful acts, performing 150 shows around the world annually and are delighted to be heading ‘home’ at the end of the year, after commitments in the Cayman Islands, Mexico, Hong Kong, USA, Puerto Rico, Philippines, Burma, Japan, Chile, Canada and more. 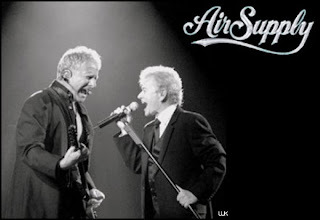 You’ll be Lost in Love with the rich, beautiful melodies and soaring harmonies from the legends of soft rock and power ballads, Air Supply, at the State Theatre Sydney on Friday 29 November, Melbourne Palais Theatre on Saturday 7 December and Perth Concert Hall on Sunday 8 December.